Bulgarian language takes а prominent place in comparative linguistics and constitutes an important link in the chain of Indo-European languages. The historical study of Bulgarian language is important not only to Bulgarians but to all other Slavs, too, because it answers many questions about the history of all Slavic languages. Bulgarian language prides itself with very old written monuments: Slavic linguistics would not be as advanced as it is now without these Old Bulgarian manuscripts; it would not be so useful to the general comparative linguistics if there wasn't Old Bulgarian language, preserved and transferred to us through millenia clearly and accurately with its living pronunciation in Bulgarian dialects. Taking into account this great importance of Old Bulgarian on one hand, and on the other — the dark obscurity that hid Bulgarians and their language for five centuries until 1878, one can understand how even bright minds can be confused about the origin of this ancient language and how everyone, affected by national sentiment, could consider it as a language close to his own nationality. Studying the language in time and place will explain this issue, will strenghten the conviction that the language of Sst Cyril and Methodius really originates in the Bulgarian land. Thus, in addition to so many phonological and morphological similarities proving the kinship of old and new Bulgarian language, Bulgarian dialectology proves also that all the beautiful words known from the Old Bulgarian monuments, exist even today in Bulgarian language — of course, not as popular words but as provincialisms. Who has not been exulted when, perusing dialect or folkloristic materials, suddenly finds some old Bulgarian word that wasn't known to exist in Bulgarian dialects? Such words sound like a distant echo from this old time when all Bulgarian Slavs spoke them as common words; but today we think of them either as deep provincialisms or as high bookish phrases, loaned from Russian literature. At the end of the first quarter of the 7th century, the settlement of the Slavs on the Balkan Peninsula was almost completed. The western Balkans were occupied with Slavic ancestors of today Serbs, Croats, and Slovenians, while its central, eastern, and southern parts, i.e., Moesia and Dobrudja, Pomoravie and Timok, Thrace and Rhodopes, Macedonia, Central and Southern Albania, Epirus, were occupied by the Slavs of the eastern Slavic group. Part of these tribes continued to inhabit wide territory north of the Danube. Slavic tribes penetrated to the southernmost parts of Greece, and settled some Aegean Islands. Data about these Slavic tribes are scarce and knowledge about them is incomplete. It is known that Severs (or Severians) lived in Dobrudja. To the west of them, the Danubian plain was settled by the great tribal Slav union called The Union of the Seven Tribes. More to the west, in the region of river Timok lived the Timochans, and in the region of river Morava lived the Moravians. In the northwestern part of Thrace, in the foothills of the Rhodopes and the Balkan lived the Dragoviches, in the basin of river Struma − Strymons (Strumiantsi or Strumians). Close to the Aegean Sea coast between the rivers Struma and Mesta was settled the tribe of the Smolians; north of the Chalkidiki Peninsula between the rivers Vardar and Struma lived the Rinkhins. In Macedonia, in the valley of the Crna river were the Berezites. Each South Slav tribe had its own dialect that was close to the dialects of the other tribes. In the second half of the 7th century, the fate of the eastern and southern Slavic tribes was forever associated with another people — Bulgars (proto-Bulgarians) — who, led by Asparuh, forced Byzantium after a series of battles to recognize in 681 the new state of Slavs and Bulgars, to conclude a peace treaty with them and pay them an annual tax. Another Bulgar leader, Kuber, with his group settled in Macedonia and from there tried to conquer Solun. During 6 to 9 century most of the Slavic tribes to the north and south of the Danube were included within the Bulgarian state, which became an attractive center for Slavs, because they considered Bulgars as their defenders and allies against the common enemy Byzantium. Slavs, through their superiority in number, assimilated first the local Thracian population, who had been partly Romanized and partly Hellenized, and then the two Bulgar tribes (one in the northeast and the other in the area of today's Macedonia). Through this process of assimilation, Slavs became the main ethnic component of the Bulgarian nation in the three geographic areas — Moesia, Thrace and Macedonia — that comprised the Bulgarian state during most of its existence until it was conquered by the Ottomans. The name of the new state — Bulgaria — was derived from Bulgars whose families governed the state administration. Such examples are not rare in the political history of European nations. It is enough to indicate the case with the French, a people of Latin origin, who took the name of the Germanic tribe Franks. It is well known and universally accepted that early Bulgarian (and Slavic, in general) literature is associated with the work of the Solun brothers Cyril and Methodius. Direct incentive for the creation of Slavic alphabet and the first Slavic books was the request of the Moravian Prince Rastislav made in 862 to the Byzantine Emperor Michael III, to send him "a bishop and mentor" to preach Christianity in understandable language. For this difficult educational mission, the Byzantine Emperor chose the Solun brothers who had been already famous for their knowledge. According to the hagiographies of the two brothers-saints, the Emperor chose them because, although they were Byzantines, as citizens of Solun they knew the language of the local Slavo-Bulgarian population. 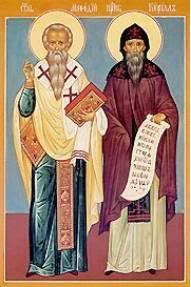 Cyril and Methodius made a new alphabet (Glagolitic alphabet) in 862 (or 863) and translated the most important liturgical books from Greek to Slavo-Bulgarian. Thus, Old Bulgarian became a literary language that served as a basis for the formation of the other Slavic literary languages. The mission of the two brothers in Moravia was not successful: their schools were closed and their students were persecuted and driven out of Moravia. Some of the students reached Bulgaria where they were met with respect and jubilation. Bulgaria was ruled at this time by the learned Tsar Boris I, who several years earlier had enforced Christianization of Bulgarians. Boris I needed the alphabet to have Byzantine liturgical books translated from Greek to Bulgarian and immediately organized building of schools and teaching the new Slavic alphabet throughout Bulgaria. Two centers of learning and writing, led by Cyril and Methodius students, were established in Bulgaria: one in the second Bulgarian capital Preslav in the northeast, led by Naum and Ioan Exarch, and the other in Ochrid in the southwest, led by Climent. In the second half of 9th and the first half of 10th centuries these centers, and also schools and monasteries throughout Bulgaria produced the earliest Slavic literature, a period which is known as the Golden Century in Bulgarian culture. In the 9th century, in Bulgaria was created another Old Bulgarian alphabet, Cyrillic alphabet which replaced the Glagolitic alphabet. Cyrillic alphabet was used by Bulgarians, Russians, Serbians, and Romanian many centuries afterwards. Gradually, elements of the respective spoken languages seeped in to replace archaic elements and thus the respective recensions of Old Bulgarian appeared (Russian recension, Serbian recension, etc.). In the Old Bulgarian period (9th to 11th century) the letters were carefully drawn without abrupt changes in the direction of writing and no connections between individual letters. The difference between writing styles concerned primarily letter size. Since 12th century the large font (Ustav writing) was replaced with a smaller font (semi-Ustav writing), in which some elements for faster writing appeared. The presence of a common written language at such early time preceding the formation of most other European nations was a great unifying factor that gave a strong impetus to the consolidation of the Bulgarian nation and the development of Bulgarian national conscience. In the following centuries during periods of foreign occupation, the effort to preserve the Bulgarian language was the main factor counteracting the assimilatory policies of the occupying powers. The territorial distribution of dialects is to a large degree also a result of the major migratory movements, which have been particularly strong for Bulgaria. From 10th century up till modern times large Bulgarian ethnic masses often moved in one direction or another, changed their territory and this has had an enormous impact on the formation, evolution and territorial distribution of today's Bulgarian dialects. As early as 10th century Bulgarian Bogomils (heretics) migrated en masse to Byzantium. In the 13th century, large numbers of Bulgarians from the Danubian plain were forcibly re-settled to Transylvania (Siebenbürgen) by Magyars and sold as slaves. The Bulgarian national conscience and unity were very negatively influenced by the invasion of the Turks that commenced in mid-14th century and resulted in their complete settlement in Bulgaria at the end of that century. The Turkish rule caused indescribable sufferings to the Bulgarian people and caused significant changes in the ethnographic situation in Bulgaria. As early as the first decades of the Turkish rule some regions lost completely their Bulgarian character. In the northeastern Bulgaria those were Ludogorieto (Deliorman), Tuzluk and the foothills of Eastern Balkan Mountains, in the southeastern Bulgaria — almost the whole Thracian plain and Eastern Rhodopes. A part of the Bulgarian population in these areas was uprooted: either killed or captured and sold into slavery. Another part escaped in inaccessible and remote highlands in the Balkans and the Central Rhodopes. A third part was forcibly removed to other places in order to free up space for the Turkish colonists. For instance, some of the few surviving citizens of the capital Tarnovo after its fall in 1393 were resettled in the Malko Tarnovo region, and others in the Central Rhodopes where they founded several settlements, e.g. Ustovo. At the time, a significant number of Bulgarians were resettled to Asia Minor. In general, in 14th and 15th century the Bulgarian population in the great plains — the Danubian and Thracian, was almost completely destroyed. Since 16th and especially 17th century, however, the Bulgarians began to climb into these lowland areas from the Balkan and Rhodopes mountains and gradually settled there, first as part-time and later as permanent workers in the Turkish chifliks (manors) and as independent farmers and shepherds. Major changes in Bulgaria occurred in the 16th century with forced Islamisation and Turkifications in the Rhodopes, Lovech, Teteven, and Gerlovo regions. Some of the Bulgarians in these areas were Turkified and others ran to faraway lands. Great changes occurred in Northern Bulgaria after the unfortunate Tarnovo uprising in 1598. In the 17th century after the failure of Chiprovtsi uprising in 1688 significant parts of northwestern Bulgaria were almost completely de-Bulgarised. Part of the population was killed, and others ran to exile in Wallachia and Banat. In 18th and 19th century during the wars between Russia and Turkey, large masses of Bulgarian population, mainly from eastern Bulgaria, escaped with the Russian troops north of Danube in Romania, Bessarabia, Azov Sea Coast, Crimea, etc. After the Liberation, there was a mass exodus of the Turkish population which was replaced by Bulgarians from the highlands. The fields and plains were quickly re-Bulgarized. Even the Banat Bulgarians returned to their native land. Migrations continued during the 20th century, beginning with the Balkan wars and the massive de-Bulgarization of Thrace and Macedonia through "voluntary" emigration of Bulgarians from Thrace in Greece 1925-1926 and the resettlement of the Bulgarians in North Dobrudzha in 1941. Some linguistic features of the Slavo-Bulgarian dialects before the appearance of Slavic books (9th century) can be inferred through the analysis of the numerous local Slavic names, preserved since that distant era in areas populated by Slavo-Bulgarians, and by old Bulgarian loan words that entered the Albanian, Greek, Romanian and Hungarian languages. 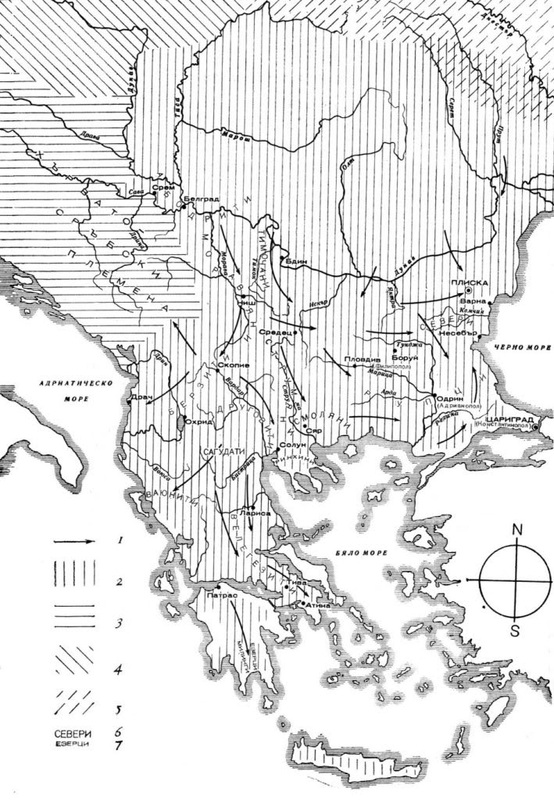 Best suited for this purpose are Slavic toponyms in today's Greece, particularly in its southern parts. Slavo-Bulgarian population in Greece was assimilated by Greeks (Hellenized) much earlier than in the trans-Danubian regions. Furthermore, the Greek lands were far from any later influence from another Slavic language. Compared with the very few Slavic loan words in the Greek language, the Greek toponyms of Slavic origin in today's Greece surprise with their great number and antiquity. Most of them reflect the very old phonetic features of the language of the Bulgarian Slavs who penetrated as already noted, deep in southern Greece. It was not so with the trans-Danubian regions that are now occupied by Hungary and Romania. Surrounded from all sides by other Slavic nations, they had been experiencing their varied impact over the following centuries. Between 6th to 9th century A.D. the Slavic languages gradually separated by a slow but constant departure from the original proto-Slavic language. In this period the Bulgarian national language slowly took shape on the basis of tribal dialects of the Slavo-Bulgarian population, whose main mass had already been located in the south-eastern regions of the Balkan Peninsula. The earliest differences between the emerging Slavic languages were phonetic. Thus, for example, in the dialects of the Slavo-Bulgarian tribes the proto-Slavic palatals *tj and *dj were already pronounced as diphtongs шт /ʃt/ (or шч /ʃtʃ/) and жд /ʒd/ (or ждж /ʒdʒ/), cf. свѣшта from pr.-Sl. свѣ/*tj/а and межда from pr.-Sl. ме/*dj/а. In all other Slavic languages these sounds underwent a different change specific for each language. An early difference between the Slavo-Bulgarian dialects and the dialects of other Slavic peoples is found in the evolution of the typical proto-Slavic vowel ѣ /*ja/ (yat). Only in the dialects of the Slavo-Bulgarians, ѣ evolved in wide e (either я /ʲa/ or е /ɛ/) which is very typical even for the modern Bulgarian language, cf. e.g. хляб /hlʲab/ (bread) or dial. хлеб /hlɛb/ from OBg. хлѣбъ. Abundant evidence shows that in the language of the Slavo-Bulgarians the palatinized *tj and *dj were pronounced as /ʃt/ and /ʒd/ and the yat vowel was pronounced as /*ja/. Those are found primarily in archaic Slavo-Bulgarian toponymy in today's Greece and South and Central Albania, i.e. in areas that were densely populated by Slavo-Bulgarian population. Thus, in today Greece there are local names as Κορύστιανη = Кориштане, Πεστά = Пешт, Μεσδάνι = Междане. South and Central Albanian toponyms are Пештер, Лешта, Хоштова, Гаждени. The fact that the yat vowel ѣ in the language of the Slavo-Bulgarians was pronounced as я /*ja/, is demonstrated by the presence of archaic Slavic toponyms in Greece as ̒Ρεάχοβου = Ряхово, Λιασκοβέτσι = Лясковец, Δρανίτσα = Дряница. In today's South and Central Albania one finds archaic Slavic toponyms like Лясковик, Лябово, Сяново, etc. Hence, it is evident why all researchers of archaic Slavic toponymy in Greece and Albania clearly state that it is a remnant of a Slavic population who spoke Bulgarian language. The diphtongs шт and жд (the diphtong шт later acquired a letter, шт = щ) and the yat vowel ѣ as in хлѣб, мѣсто, грѣх remain typical for a large part of the Bulgarian dialects. Mutation of the proto-Slavic /*tj/, /*dj/ as шт /ʃt/ (or шч /ʃtʃ/), жд /ʒd/ in words like хоштѫ, виждѫ, etc. Old Bulgarian shows many common features with stages of development of the other Slavic languages. However, the translations of the Solun brothers show a number of morphological and syntactic features that were typical only for the Bulgarian population of 9th to 11th centuries, mostly word combinations like сестра еи (bg:сестра ӣ, her sister), братъ емоу (bg:брат му, his brother), рѫка ти (bg:ръката ти, your hand) that were not used by other Slavs. The main morphological features of Old Bulgarian are presence of cases, the presence of a variant of the infinitive form called supine form, synthetic adjective comparison forms, past infinite, past finite, and future simple verb tenses, etc. The Bulgarian character of the language of Cyril and Methodius was scientifically proven as early as 19th century during the emergence of Slavic linguistics on the basis of the above phonetic features. The most important evidence are the above mentioned diphtongs шт and жд that appear in old Bulgarian manuscripts instead of the proto-Slavic palatals *tj and *dj. This is a typical feature only for Bulgarian: all other Slavic languages have other replacements of these proto-Slavic phonemes. Thus, e.g., the proto-Slavic forms свѣт/*tj/а, ме/*dј/а in old manuscripts are written as свѣшта, межда (as they are spoken in modern Bulgarian) unlike the Serbo-Croatian свећа, међа, Russian свеча, межа, Polish swieca, miedza, Czech svice, meze. Moreover, the шт/жд mutation is a feature, characteristic for the whole Bulgarian dialect area. Data from old manuscripts, toponyms, and modern dialects show convincingly that the modern ќ /c/, ѓ /ɟ/ instead of шт, жд, e.g. свеќа, граѓанин for свешта, гражданин in some Western Bulgarian dialects, especially in those from the central and northern part of Vardar Macedonia and also in some Thracian dialects, are a much later phenomenon. It is indicative in this respect that words with old шт, жд are used alongside the new ќ, ѓ in many of these dialects, e.g. свеќа alongside with свештник and мошне. Cf. also веќе, ќи, ќерка, but къшча, свешча, чуждина, прежда, веждите, etc. (Kostur dialect); куйќа, полноќ, помеѓу, нейќит, but рождат, нош, фаштат, свешча, гашчи, чуж, etc. (Resen dialect). In contrast to the great variety of mutations in the modern western Bulgarian dialects, old manuscripts contain only шт, жд forms, irrespective of the region from which they originate. Important in this respect is the comparatively recent Bulgarian-Greek dictionary that was written in the Kostur region in 16th century. The dictionary has only шт, жд forms: кашта, вяжда, рожда. Another important evidence for the Bulgarian character of the Cyril and Methodius language is the above-mentioned pronunciation of ѣ, which was written in words like хлѣбъ, млѣко, вѣра, etc. Yat (ѣ) was pronounced as /*ja/ or wide е /*e/ which is suggested by the fact that in the glagolithic alphabet invented by Cyril there is only one common letter for ѣ and ѩ. Reliable data show that in 9th-11th century the wide pronunciation of ѣ was spread on the whole language area that included the regions Moesia, Thrace, and Macedonia. As already noted, the former /*ja/ pronunciation of ѣ in the western Bulgarian regions is mainly inferred from old Greek names of some Slavic toponyms in today's Ekavian regions like Πριλιάπος = Прилѣпъ, Πρίσδριανα = Призрѣнъ, Δεάβολις = Дѣволъ, Χτεάτοβο = Хтѣтово, Тетово, Τριάδιτσα = Срѣдьць, etc. Western Bulgarian forms like цадим (OBg:цѣдити), цаним (OBg:цѣнити), цалувам (OBg:цѣловати), цапам (OBg:цѣпити) with a de-palatized (hardened) consonant ц /ts/ in front of the wide vowel /ʲa/ or /e/ are another evidence that the western Bulgarian pronunciation цел, хлеб, место, тесно is a late phenomenon. A third very characteristic feature of the Cyril-Methodius' language is the peculiar nasal pronunciation of the vowels ѫ /*oⁿ/ and ѧ /*eⁿ/. Pronunciation of these vowels is supposed to has been similar to the French /ɔ̃/ in bon and /ɛ̃/ in bien. This is a typical feature of the 9th to 11th century Bulgarian, with a Slavic analog only in Polish language. That in the past this feature was characteristic for the whole language area is concluded, as already pointed out, again from the archaic Slavic toponymy in Greece, from some phonetic features of the old Slavic loan words in Romanian and Albanian language, from the language of the so-called Cherged prayers, reflecting the speech of old re-settlers from Svishtov region of 16th century. Traces of the old nasal pronunciation are found in forms like зъмби, мънка, пънт, рънка, дъмп, скъмп, крънгове, братученд, глендам, гренда, ерембица, чендо, ендзик, etc. in the speech of re-settlers from Solun, Kostur, Korca, western Aegean, and other regions. Individual cases of nasalism are found in the Rhodopes dialects. These typical features for Old Bulgarian has been lost or modified as a result of various influences in the course of language evolution but have persisted and are best preserved in southern dialects — Rhodopes, Southern Thrace and Southern Macedonia. Today the wide ѣ pronunciation, replacements шт, жд for the old palatals *tj, *dj, traces of ы, traces of case forms, traces of archaic pronunciation of ѫ and ѧ, the identical pronunciation of ѣ and ѩ (/hlʲab/ or /hlɛb/, /ʲama/ or /ɛma/), the reduction of vowels а, о, е, the mutation of /a/ in /ɛ/ behind fricatives (чаша — чеши), etc., approximate the southern Macedonian dialects with the Thracian and Rhodopes dialects. Solun dialects are of eastern Bulgarian (Rup) type. On the basis of pronunciation of the old yat vowel, Bulgarian dialects are divided into two major dialect groups — western (Ekavian) and eastern (Yakavian). In the north, the border between Ekavian and Yakavian goes along the river Vit, in the south — along river Mesta in a general direction Nikopol-Solun (see map of the Yat border). Archaic pronunciation of wide e occurs in some dialects along the Yat border, in the Rhodopes and some other southern dialects. In general, to the east of the Yat border, the Old Bulgarian vowel ѣ, when stressed, is pronounced as wide vowel /ʲa/ (/mlˈʲako/, /(h)lˈʲap/) while to the west of the Yat border ѣ is pronounced as /ɛ/ (/mlɛko/, /(h)lɛp/). Data from the old manuscripts, some old toponyms, Bulgarian loan words in other Balkan languages, etc., show that the yat division is relatively recent — the first certain cases of ekavism occur in writings of 13th century. The south-western dialects are partly in the Ekavian, and partly in Yakavian areas. The wide pronunciation of ѣ is preserved in some archaic dialects (Solun, Ser (also Syar /sʲar/), Korca). The above mentioned Bulgarian-Greek dictionary written in 16th century in Kostur reflects the old wide yat sound in words like колѩно, невѩста, млѩко. 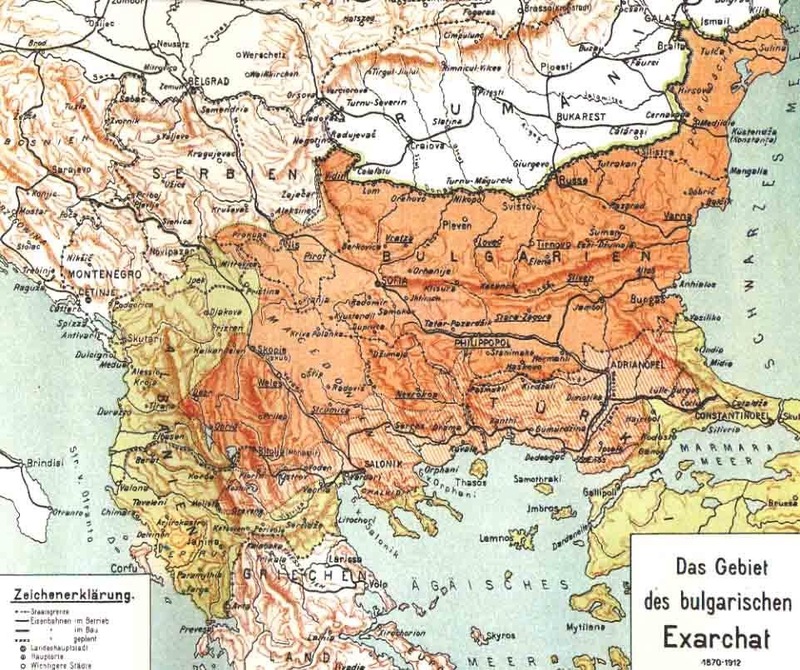 The Bulgarian Exarchate (1870-1912) and the Bulgarian dialect area. All listed and also a number of other changes occurred in parallel with the development of Bulgarian dialects in Moesia, Thrace and Macedonia resulting in the formation of the general structure of modern Bulgarian. These characteristic linguistic features unite all Bulgarian dialects and separate them in a single individual group within the other Slavic languages. The period of formation of Modern Bulgarian − from 15th century till present − is clearly divided in two parts. The longer first part, 15th to end of 18th century, bears the deep marks of the Ottoman rule. At the very start of the 15th century, there was not even a trace left of the former glory of Bulgarian culture, or, for that matter, of anything 'Bulgarian'. The Tarnovo Patriarchy was abolished and Bulgarians were put under the auspices of the Greek Patriarchy at Constantinople; Bulgarian churches, monasteries, schools, and books were destroyed; Bulgarian ethnicity and nationality themselves were abolished as concepts. Peoples in the Ottoman empire were classified on the principle of religion in a system based on the so-called millets. Bulgarians together with other Christians were included in a millet ruled by the Greek Patriarchy. Thus, from the very beginning, Bulgarians were affected by double assimilation: Turkish (the official language of the Ottoman Empire), and Greek (the language of church and school in the Christian millet). Soon the use of Bulgarian language was confined to very close circles: within the family or, at most, within the local village. This disruptive trend continued and even intensified in the 16th and 17th centuries with the mass migrations of various peoples in and out of Bulgaria and forcible Islamisations and Turkifications of large Bulgarian-speaking regions. The language responded to these circumstances with separation into numerous more or less localized dialects. Instead of a single nation-state with a common language, Bulgaria in this period consisted of patches, each speaking a dialect more or less resembling Middle Bulgarian, interspersed with patches, speaking dialects of other languages: Turkish, Greek, Vlach, Albanian, Gagauz, Tatar, Circassian, etc. As in Old Bulgarian, in the earlier Middle and Modern Bulgarian transformations, the dialects of Bulgarians in Thrace, Moesia, and Macedonia Macedonia follow the same trends. From the end of 16th century to the middle of 19th century, in the Bulgarian lands, an effort was made to create a literary language on the basis of common spoken language through damaskins, collections of texts with a religious and moral content. The name damaskin comes from the Greek bishop and scholar Damaskinos Stouditis whose compendium Treasure (1558) contained 36 hagiographies and moral teachings. The first damaskins were written in Western Bulgaria. They contained only works by Damaskinos Stouditis and were written in literary language of that time that included also elements of the common spoken language. The oldest damaskins (16 to 17 c.) were Rilski, Kostenecki, Elenski, Adzharski. Damaskin literature changed at the end of 17 century. Part of the known works of Damaskinos Stouditis were translated in Modern Bulgarian and were combined with works of other authors. Collections with a mixed content in the common spoken language were compiled, in which works of Damaskinos Stouditis still dominated. In Central Bulgaria (the Balkan and the Middle Mountains) several big and well prepared damaskins were published: Protopopinski, Troyanski, Dryanovski, Koprivshtenski, Tihonravov, etc. In 17th century, damaskins went out of the confines of churches and monasteries to be used by common people. Their content became richer, the language came closer to the living language. The works of Damaskinos Stouditis took a smaller part, and the rest was filled with works of various topics and genres: biographies, teachings, apocryphs, religious tales, novelettes, witty sentences, taken from older Bulgarian compendiums or translated from Modern Greek printed books of 17th century. All works in the damaskins had easy to read content and style and reflected the characteristic traits of various Bulgarian dialects. Some of the more significant damaskins from 18th century were: Pazardzishki (1753), Panteleev, damaskin by Josif the Bearded, damaskin by Pop Puncho from 1796, etc. Damaskins educated Bulgarians to resist attempts for assimilation through Islamization and Turkification by giving a large space to the hagiographies of early Christian martyrs, pointing to moral norms, decrying superstitions. Translators reworked individual words, putting some elements of Bulgarian reality. More famous damaskin writers were Daskal Nedyalko and his son Philip (17th c.), Josif the Bearded, Pop Puncho, Pop Todor Vrachanski, Hieromonach Roman, Nikiphor of Arbanasi, Theophan Rilski (18th c.), Daskal Todor Pirdopski (19th c.), etc. Damaskin literature was widely distributed in 17-18 centuries to fulfil the needs of Bulgarian readers. It is an important source for linguistic study and an interesting linguistic phenomenon which shows the increasing democratic trends in Bulgarian literature. By their content, damaskins belong to the Medieval literature but with their new elements they show a transition to a new type of literature. In spite of the wide-spread destructionl of Bulgarian books during the Ottoman rule, there are about 200 damaskins preserved today. They are stored in the Bulgarian National Library, the National Church Historical and Archeological Museum in Sofia, the Archive of the Bulgarian Academy of Sciences, the Plovdiv National Library, the Rila Monastery. Damaskins are stored in libraries in Moscow, St. Petersburg, Odessa, Belgrade, Bucharest, Ljubljana. Only a small part is published. Instability in the old case system, which resulted in loss of cases in Modern Bulgarian in contrast to all other Slavic languages. For example, the old relation between generative and dative lost its case form and acquired a new form consisting of the preposition на (of, to) and a noun in its general form, cf. майката на детето (the mother of the child instead of the child's mother) and дадох му на детето (I gave to the child instead of I gave the child). Today, traces of old case form are found only in some archaic dialects in the Rhodope, Thrace, Korca. Development of an article form. A general characteristic of all Bulgarian dialects is the definite article — мъж-ът (-а, -от, -о) (for masculine), жена-та (for feminine), дете-то (for neutral), полета-та (for plural). This specifically Bulgarian feature developed mainly in the Middle Bulgarian period: old forms of the indicative pronoun are added as suffices to the nouns and adjectives. This feature characterizes all Bulgarian dialects and distinguishes them together with the loss of the case system, from all other Slavic languages. In some dialect areas (all northeast and part of the west and south-east) article form acquired only pronouns that had an element т-. Other dialects have the so-called triple article form: articulating consists in adding the pronoun roots т-, с-, н- or т-, в-, н-, some of which indicate near objects, and others indicate more distant objects. Thus, in the Rhodope are found article forms like жената, женаса, женана, and in Tran, Breznik and some dialects from Middle Vardar − жената, женава, женана. Replacement of the old infinitive and supine forms with a да construct: (хощѫ) ити → (искам) да ида. The infinitive decomposition evolved uniformly in all Bulgarian dialects. Retention of the simple verb forms for the past tense (past finite and past infinite) in all Bulgarian dialects of Thrace, Moesia and Macedonia. As repeatedly emphasized in linguistic literature, these are the most important features that highlight the specifics of Bulgarian language. It can be definitely said that a Slavic population, whose language structure is characterized by these four factors is or has been Bulgarian. doubling of the direct object, e.g. виде го детето (го виде детето) (he saw (it) the child), каза им на децата (he told (them) the children), etc. In relation to this feature, pronoun constructs of the type мене ме, мене ми, тебе те, тебе ти (e.g. мене ми се спи, тебе те е страх), etc., came into use. rich temporal and modal verb system: 9 verb tenses and 4 moods. While loss of cases resulted in simplification of the noun system, the verbs not only preserved their former variety of temporal forms (tenses) but acquired new forms, e.g. the so-called renarrative verb forms - "Казват, че написал писмо." ("They say that he has written (vs. he wrote) a letter"). This is a characteristic feature for Bulgarian. The other Slavic languages are characterized with a more complex noun system and a simpler verb system. an analytic construct for future tense with the particle ще (ше, че, ке, ќе, жъ, зъ, and others) and a definitive verb form, e.g. ще ида, че ида, ќе ида, etc. This construct replaced the old simple future tense (cf. OBg:поидѫ), and also constructs that contained an auxiliary verb and infinitive form (cf. OBg:хощѫ ити). counting form with suffix -а for plural masculine nouns used at the end of cardinals as a remnant of the old pair number (e.g. два стола (two chairs), три бора (three pines)), as well as retained archaic repeat forms to designate paired objects (e.g. ръце, нозе (hands, legs)). suffix -ове (-ови) for monosyllabic masculine summative nouns, e.g. кумове, сватове (сватови), etc. a new verb conjugation with -а element (cf. verbs of type гледам, гледаш, давам, даваш). formation of possessive pronouns for third person singular and plural from the old generative form of the personal and indicative pronouns него-в, тех-ен, них-ен (них-ни). The spelling reform of 1945 applied more stringently the phonetic principle, freed the spelling from unnecessary traditionalism and placed it closer to the living language. It facilitated learning spelling and pronunciation. Letters without phonetic equivalents were removed (ѣ and ѫ; ъ and ь at the end of words). 1. For some of the most important works of this period, see Ivanova K. and S. Nikolova. Celebration of Words. The Golden Century of Bulgarian Literature: Annals, Biographies, Theology, Rhetorics, Poetry (Тържество на Словото. Златният Век на Българската Книжнина: Летописи, жития, богословие, риторика, поезия). Sofia: Agata-A, 1995. 3. For a detailed ethnography and language characteristic of Bulgarians in Transylvania and Banat, see Balkanski, Todor. Transylvanian (Siebenbürgen) Bulgarians: ethnos, language, ethnonymy, onomastics, prosopographies. (Трансилванските (седмиградските) българи. Етнос. Език. Етнонимия. Ономастика. Просопографии), IK Znak-94, Veliko Tarnovo, 1996; Miletich, Lyubomir. Study of Bulgarians in Siebenbürgen and Banat (Изследвания за българите в Седмиградско и Банат). Nauka i Izkustvo, Sofia, 1987. 4. Mikov, V. Origin and significance of the names of Bulgarian cities, villages, rivers, mountains, and places (Произход и значение на имената на нашите градове, села, реки, планини и места). Sofia, 1943, p. 64. 6. Б. Цонев, История на българский език, т. I, С., 1919; 1940; т. II, 1934; т. III, 1937. 7. Ст. Младенов, История на българския език. С., 1979. 8. К. Мирчев, Историческа граматика на българския език, С., 1958; 1963; 1978. 9. Max Vasmer (1941). Die Slaven in Griechenland, Mit eine Karte. Verlag der Akademie der Wissenschaften, Berlin, 1941 (Zentral Antiquariat der Deutschen Demokratischen Republik, Leipzig 1970). 10. Селищев, Афанасий. Избранные труды, Москва 1968. 11. For details, see V. Jagić, Entstehungsgeschichte der altkirchen-slawischen Sprache, Berlin, 1913. 12. This manuscript, published by C. Gianelli and A. Vaiant is kept in the Vatican Library and has the title Beginning. Bulgarian words and their correspondence with the folk [Greek] language (Ἀρχ(ὴ) ἐν Βουλγαρὶοις ριμὰτον, εἰς κινῆ γλότα ἐρχομἕνη). 13. Evidence for the old Bulgarian character of ѣ is given in van Wijk, N. History of the Old Slavic language (История старославянското языка), Moscow, 1957, pp. 188-189. 14. Младенов, Ст. Понятието „български език” и границите на българския език. Брой и разпространение на българите (The term "Bulgarian languge" and boundaries of Bulgarian language. Number and distribution of Bulgarians). In: Младенов, Ст. История на българския език (History of Bulgarian language). Sofia, 1979, 21-22. 15. Mladenov, Stefan. Geschichte der bulgarischen Sprache, Berlin, Leipzig, 1929. 18. van Wijk, N. History of old Slavic language (История старославянското языка), Moscow, 1957, p. 37. 19. Considering the striking individualty of Bulgarian compared with the other Slavic languages outlined on the basis of the above features some non-Bulgarian linguists use also the terms: east-southern Slavic dialects; Balkano-Slavic dialects; Slavic dialects in Northern Greece, Republic of Macedonia and Bulgaria; Bulgarian-Macedonian dialects, etc. With such descriptions they indicate the dialects of the whole Bulgarian historical and geographic dialect territory. Although they avoid using explicitly the national designation, in fact, they acknowledge the individuality and unity of Bulgarian language. 22. Jireček, K. J. (1876) (in German). Geschichte der Bulgaren. Nachdr. d. Ausg. Prag 1876, Hildesheim, New York : Olms 1977. ISBN 3-487-06408-1. http://books.google.com/books?id=VBhThVLpc4MC&pg=PA88&dq=isbn=3487064081&hl= bg&sig=fAZ7WUtHdEDBNEJos4IeObUcFyY. 24. П. А. Лавров. Дамаскин Студит и сборники его имени "Дамаскины" в южнославянской письменности (Damaskinos Studitis and his namesake compendia "Damaskins" in the south-Slavic writings). Одесса, 1899. 25. Д. Петканова-Тотева. Дамаскините в българската литература (Damaskins in Bulgarian literature). София, 1965. 26. Ев. И. Демина. Тихонравовский дамаскин - болгарский памятник XVII в. Исследование и текст (Tihonravov damaskin: a Bulgarian monument from 17 c.). Part 1-2. Sofia, 1968-1972. 27. Б. Ст. Ангелов. Съвременници на Паисий (Paisiy's contemporaries. Vol. 1-2. Sofia, 1963-1964. 28. П. Динеков. Българската литература през XVII и първата половина на XVIII в. В: История на българската литература в четири тома (Bulgarian literature in the 17th and the first half of 18th centuries In: History of Bulgarian literature in four volumes). Vol. 1. Sofia, 1962. 29. Л. Андрейчин. Основна българска граматика (Basic Bulgarian grammar). Sofia, 1944. 30. Л. Андрейчин. Някои въпроси около възникването и изграждането на българския книжовен език във връзка с историческите условия на нашето Възраждане (Some issues connected with the origin and development of the Bulgarian literary language in the historical circumstances of the Bulgarian Renaissance). Бълг. език (Bulgarian language), No. 4, 1955. 31. Л. Андрейчин. Унификационни процеси в българския книжовен език през първите две десетилетия след Освобождението (Unification processes in the Bulgarian literary language in the first two decades after Liberation). Бълг. език (Bulgarian language), No. 5, 1973. 32. Л. Андрейчин. 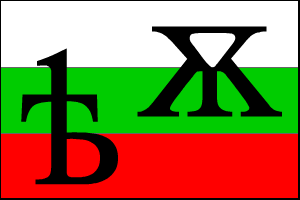 Единството на българския език в миналото и днес (Unity of Bulgarian language in the past and today). Бълг. език (Bulgarian language), No. 1, 1978. 33. Стойков (Stoykov), Стойко (2002)  (in Bulgarian). Българска диалектология (Bulgarian dialectology). София: Акад. изд. "Проф. Марин Дринов". ISBN 9544308466. OCLC 53429452. Copyright (c) 2009 Lyudmil Antonov. All Rights Reserved. Do you know the history of the greek word for nymph that is supposedly a slang/term for bride/wife that was then lent into Romanian as nevasta? The Romanian nevesta was loaned from the Old Bulgarian невѣста. With the current drive to expel Slavic (Bulgarian) words from Romanian the word nevesta is almost replaced with the omophone mireasă. How would you comment other name pertained to bride/wife: bulka? The word exists in the Russian language and it means a bread ( a loaf of bread). Are its roots coming from bulo (veil)? In Romanian nevAstă means (only) wife (and it is used a lot) and mireasă means (only) bride. Great work. You really helped me out! This blog is really good. I think it is always helpful to know something about the history of a foreign language when you are learning it. Especially languages like that will also help you to learn other Slavic languages. However, If you need a Bulgarian translation of a legal document or any other document make sure that it is done by professionals.